What is the Best Cat Water Fountain? 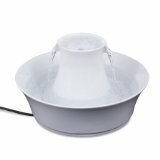 – Find the best automatic litter box here! Like all creatures, cats need plenty of water to stay healthy. Cats aren’t generally heavy drinkers, though. They usually prefer to get their fluid from their meals. In your home, this means they get much of their water from eating wet food. If your cat doesn’t eat much wet food, though, he might not be getting the fluid he needs. Shiny, lustrous coat. A dull, lifeless coat means poor fluid intake or inadequate nutrition. Regular urination. If your cat isn’t urinating two or three times a day, he’s likely not getting the water he needs. Elastic, supple skin. To test, gently grab the skin around the nape of your cat’s neck, then release it. The skin should “bounce” back if the cat gets plenty of water. If you’re worried about your cat’s water intake, why not try a drinking fountain? Cat water fountains cycle running water into a bowl constantly, so there’s always a fresh drink waiting for your cat. Cats are fascinated by running water, so a fountain will encourage him to lap it up. Below I’ve listed reviews for several highly rated pet drinking fountains. Click on any product name to go right to its Amazon page, where you can buy it, read reviews, and find the best cat water fountain for you. This is one of the best cat water fountains for the money. It features three different-height drinking levels and two waterfalls, so your finicky cat can find his own favorite watering hole. The Cat Mate uses a polymer-carbon filter to purify water, which is great for removing impurities like chlorine, bacteria, and harmful toxins. The filter can be replaced to keep the water fresh. This fountain has a capacity of 2 liters of water. That’s more than enough to last a multi-cat household for several days. 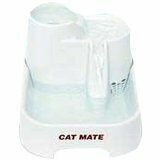 The Cat Mate is one of the quietest water fountains. It’s quieter than the Petmate, which is a model that’s similar to the Cat Mate. This fountain is so quiet because of a clamp that prevents motor vibration, which is something the Petmate lacks. This fountain will only get noisy if it’s running while the water level is too low. The fountain’s flow rate is very good. Water flows at a reasonable pace to keep cats satisfied. The flowing water doesn’t make a loud splashing sound that might annoy you. The fountain is very easy to clean and stays clean for a decent amount of time. One of the only complaints on Amazon is that the pump died too soon. This is an uncommon complaint, however. This attractive stainless steel cat water fountain will look great in a modern-style kitchen. It features a 60-ounce water capacity, two drinking bowls, and a carbon filter for removing impurities. The Pioneer Pet is a great choice for cat owners who hate feeding their cat from plastic bowls. 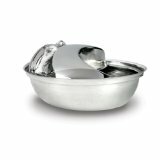 Its food-grade stainless steel interior is dishwasher safe and easy to clean. You can adjust the water output to suit your needs. At the lowest level, it’s an inaudible flow, but at the highest, it’s a noticeable sound. Many users say that their cats liked the Pioneer fountain immediately. This fountain is also great for dogs, too. You’ll need to replace the carbon filter when it expires, but they’re only a few dollars a piece. You can purchase a replacement pack (contains 4 filters) on Amazon. As with other electronic fountains, some reviewers complained about the pump going out. This only happened, in general, after about a year of heavy use. Most reviewers were extremely happy with the fountain. This fountain is also offered in black or white ceramic if you don’t want stainless steel. You can see the ceramic cat water fountain here. 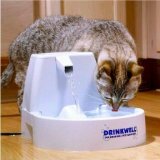 The Drinkwell cat water fountain is a good choice for the pet owner who prefers a no-frills approach. The fountain holds 50 ounces of water and has a 5-inch waterfall stream of flowing water. That’s especially nice for cats that love to drink from a stream. This fountain, like the Pioneer Pet, relies on carbon filters to get rid of bad tastes. You can purchase an extra pack of filters on Amazon for a few dollars. If you need a quiet fountain, this one is ideal for you. It has a curved ramp that prevents water from making splashing noises, and the submersible pump always stays silent under the water. The Drinkwell has four rubber feet that keep the fountain adhered to the floor. You’ll like this if your cat gets “pushy” or tries to knock the fountain over. Some Amazon reviewers said that the 5-inch long waterfall stream resulted in their cats getting splashed in the face when they drank. The cats did not care for this, naturally. If your cat doesn’t mind splashing water, he should be fine. The fountain is good for cats as well as dogs. Drinkwell makes a few other models that hold more water, such as the 360, Platinum, and Big Dog models. The Original model is fine enough for most cats. 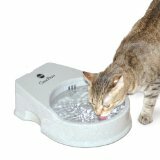 Here’s an inexpensive cat fountain that’s also highly rated. It holds 80 ounces of water, which is quite a bit more than some other higher-priced fountains. You can also add to that capacity with an optional 1.5 gallon reservoir tank. The K&H CleanFlow uses a charcoal filter to get rid of impurities. This fountain filters water up to 130 times an hour for a really fresh taste. Filtration is accomplished with a water agitator placed at the bottom of the bowl. It swirls and oxygenates water, then moves clean water to the surface for your cat to enjoy. The charcoal filter can get rid of both small and large impurities. The CleanFlow has a very simple design, so it’s easy to take it apart and clean it in the dishwasher. This fountain keeps the water flowing, but it doesn’t have the splashing problem that waterfall-style fountains have. It has a submerged pump for quiet operation, so you’ll rarely hear it running. Like others, it does get quite loud when the tank is empty. This fountain, unlike others that are made from plastic, is made from a more hygienic porcelain material. It holds 70 ounces of water, has two flowing waterfalls, and features a pretty white circular design. The design makes it easy for multiple cats to drink at once. The Drinkwell has a charcoal filter that will need occasional replacing. Assembly is easy and fast–you can have the Drinkwell running in just 10 minutes. The porcelain is also easily cleanable. Most users say that the Drinkwell is virtually silent. There are very few negative reviews for the product. Only a few complained of a defective part, which PetSafe tends to replace.